We carry the four top brands of adjustable bed bases: Leggett and Platt, Electropedic, Comfort Direct and Transfer Master. Between these four companies, we can offer bases with just about every function and feature available. Any of our mattresses can be matched with any of our bases, giving you the widest selection of adjustable beds anywhere! Give us a call today and let us custom fit you to the perfect bed! Adjustable Bed Mart is proud to carry the new line of adjustable bed bases from Electropedic Manufacturing. 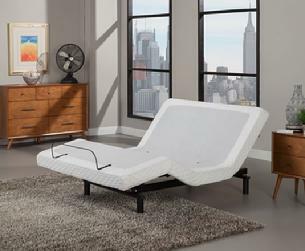 Offering two different models, Electropedic Adjustable Beds Bases have one of the longest warranty on the market and a nationwide service network. Both models of Electropedic adjustable base feature Wall Saver Technology, allowing you to stay close to your night stand as you raise your head. Adjustable Bed Mart is proud to carry the American Made line of adjustable bed bases from Leggett and Platt. Offering a multitude of models with both hard wired and wireless remote controls, Leggett and Platt adjustable bases offer more choices and options than any other company. Adjustable Bed Mart is proud to carry the complete line of adjustable bed bases from Comfort Direct. A great basic adjustable bed at a very reasonable price. Made by a local Coachella Valley company, this base provides the same quality as Leggett and Platt bases but at a lower price. Available in three different models with a variety of options. Adjustable Bed Mart is proud to offer the complete line of adjustable bed bases from Transfer Master. 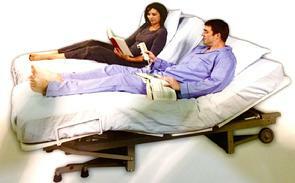 Transfer Master is the leader in Hi-Low adjustable beds. In a hi-low bed, in addition to head and foot adjustment, the height of the whole base can be adjusted up and down to facilitate transferring in and out of the bed from a wheelchair. NEW!....Transfer Master beds are now available in portable versions that can be shipped via FedEx Ground. They can be set up and ready for use in 10 min!